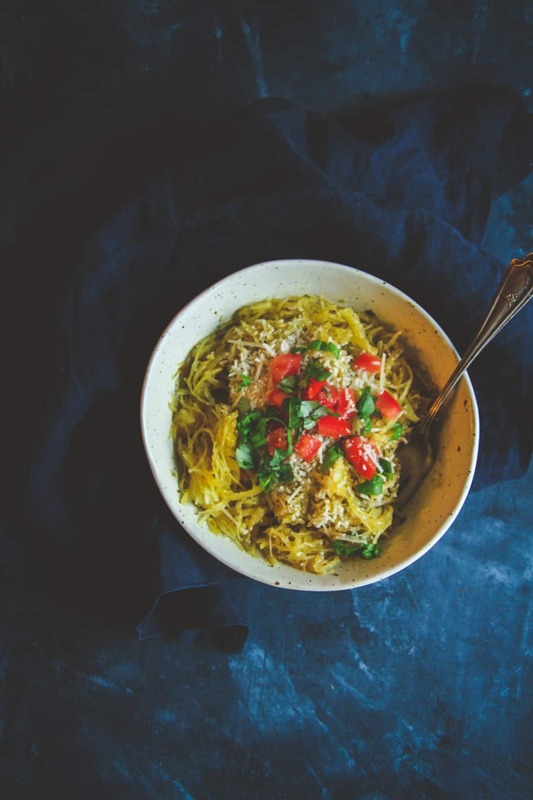 When you’re craving pasta but don’t want to have the crabs or calories, you can indulge in this healthy 5 ingredient spaghetti squash pesto “pasta” recipe as a delicious alternative. It’s squash that when cooked seriously looks like spaghetti. It can be used in place of pasta because it’s very mild in taste. It works so well as a healthy alternative to pasta. 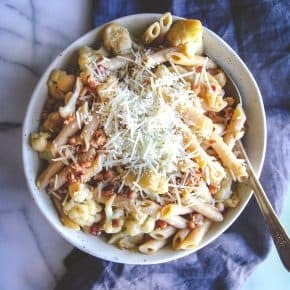 For the first 5-ingredient recipe of the year in my Five Ingredient Friday series, I just had a to post a healthy recipe! 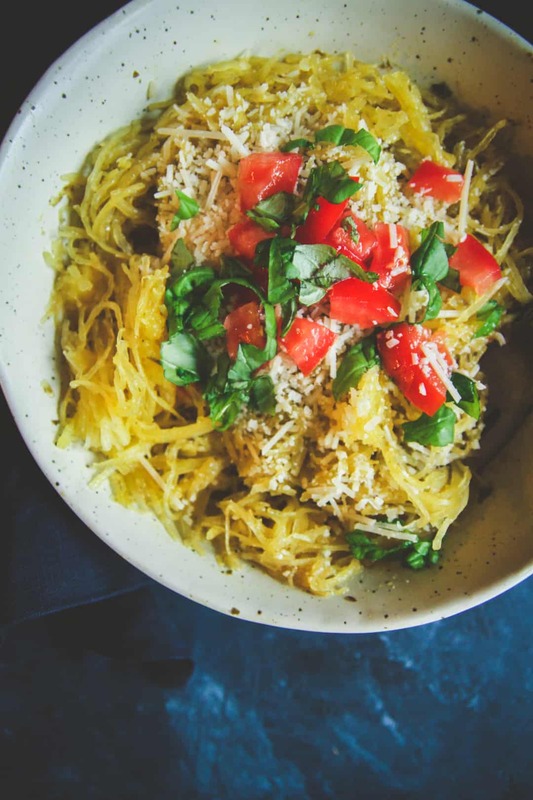 The five ingredients for this recipe are a spaghetti squash, pesto, parmesan cheese, tomato and some parsley. The one thing I used to absolutely hate about spaghetti squash is that it would take FOREVER to bake in the oven. But guess what? 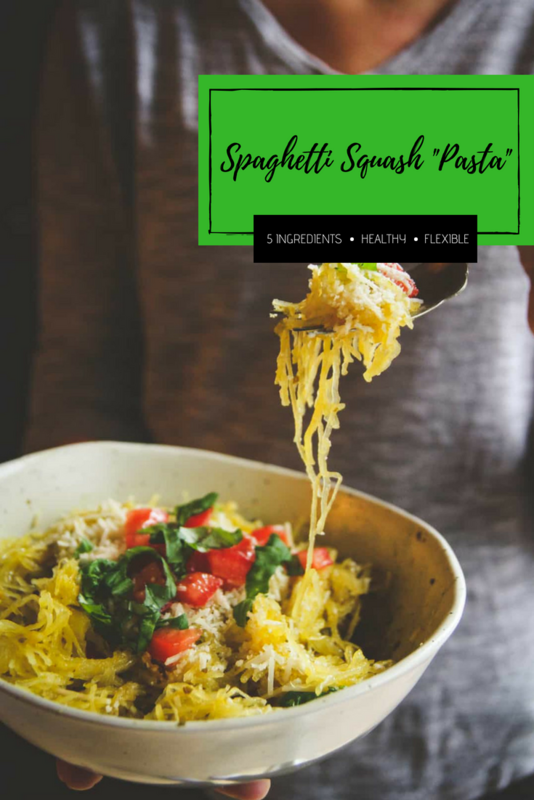 I found out that spaghetti squash can be cooked in the microwave, and after testing it out a few times (I’ve had it explode in the microwave so I’ve got my best tips for you in the recipe so this doesn’t happen to you) I am so excited to share this 5 ingredient spaghetti squash pesto pasta recipe with you. And this recipe can easily be made into a “main” by adding your favorite protein (chicken, tofu, and shrimp work really well with this dish). 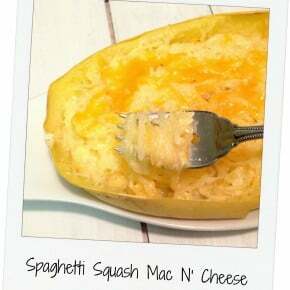 Using a fork poke holes all over a 2-2 1/2 pound spaghetti squash (you want to make sure to do this, otherwise the squash will explode in your microwave). Put the squash in a large microwave safe bowl, and microwave for 6 minutes. 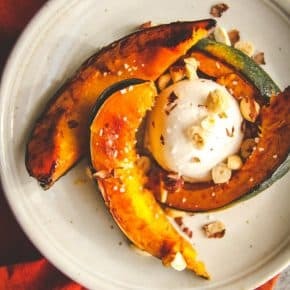 turn the squash and microwave until the shell is sofe when poked with a fork, another 5-8 minutes. Let cool for 5-10 minutes, or until it is ok to touch. Transfer the squash to a cutting board and cut in half and scoop out the seeds/innards and discard. Using a fork, gently pull apart the spaghetti strands of squash and put in a bowl. Thank you so much, really appreciate you following along 🙂 Hope you have a wonderful 2018! 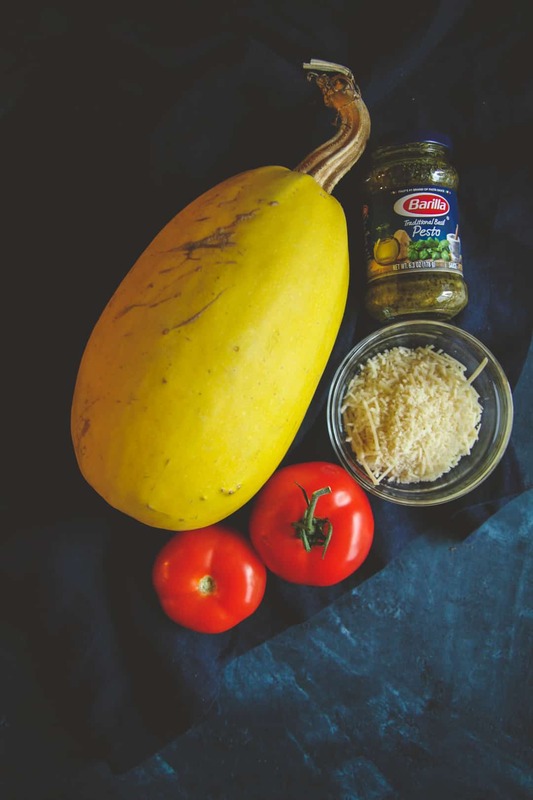 I love, love spaghetti squash but I always smile to myself when I hear it described as a replacement for pasta, lol, maybe somewhere in the four corners of my “nutrition wins out, good for my body” brain it can be described that way . . . Love your recipes . . . Happy New Year! That sounds amazing . I can’t wait until the ice storm we are having passes and I can try it. We freeze homemade pesto all summer when our basil is beautiful so we have plenty of garlicky pesto on-hand. Perfect. Oh my goodness, that sounds amazing! I hope your ice storm has passed 🙂 Thank you as always for commenting! That looks yum!! My new years resolution is to lose weight. And i’m actually serious about it this time…. Me too Kim, it’s so hard to get going on it, isn’t it? I’m here with you trying! My resolution this year is to just continue on my health and wellness journey and to give myself more grace. I’m my own worst critic (I know that’s pretty typical), but I’m really quick to doubt myself and beat myself up. I don’t think I can ever have true health and wellness on that path. I love that about giving yourself more grace. I too struggle with that. Happy 2018! My resolution for this year is to learn to make a great loaf of sourdough bread! Its been on my culinary bucket list way too long and I vow to make it happen in 2018. My kids love the flavor of sourdough bread as much as me, so I’m not just doing it for myself. That’s such a cool resolution Jeffrey, best of luck!!! My New Year’s Resolution really isn’t a Resolution……..Continue to be Healthy !! I made the resolution to move more and sit less every day. So far, it has been easy to keep! That’s awesome Mary, thank you for sharing! One of my New Year’s Resolutions is to travel and explore new places. I won trip to NYC recently that is scheduled for middle of March and have a road trip scheduled for the end of this month to see places in my state that I haven’t seen. Oh my goodness, that’s such a wonderful resolution – and how cool you won a trip to NYC, I hope you have so much fun! My resolution is to get exercising again. I had a horrible cold for a few weeks and need to MOVE! Best of luck Amy! I know how hard it is to get back into the swing of things! I usually don’t make resolutions, however I’m challengeing myself to have a positive attitude going to work each and every day. I’m going to deflect negative attitudes and walk away before words can be said that can’t be taken back. I’m going to be grateful to have my job which I really like and allows me to live the lifestyle I have. I love that attitude Cherie! My resolution is to be a better version of myself and reach out to, or stay in contact with old friends. My resolution is to lose 30 lbs! I’m right there wish you Linda, I definitely need to lose weight – hoping you reach your goals!!! My resolution this year is to cut sugar out of my diet. I have found, while experimenting, that I have so much more energy when I do. Sugar in my diet always ends with a nap. No time for that! I am totally with you Anita! I have definitely reduced my sugar intake – I didn’t have any sugar for a few days and had the worst headache, but then I felt so much better, so I’m hoping to continue with the sugar reduction. 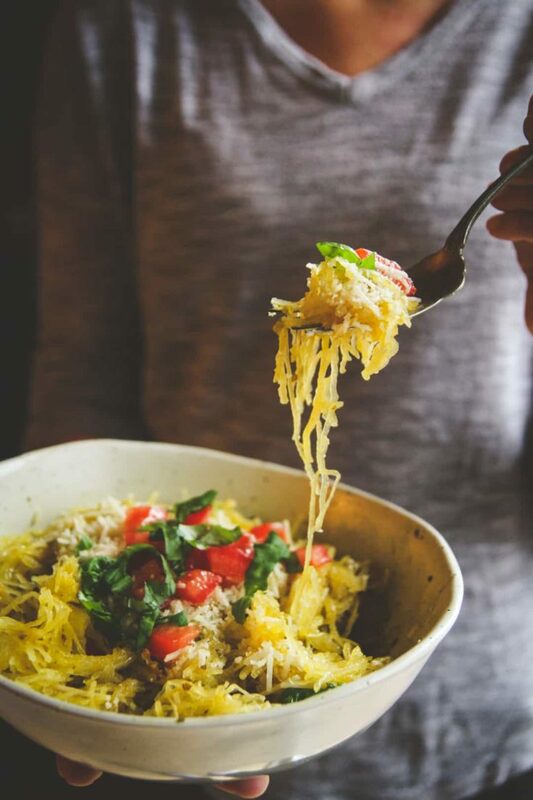 This spaghetti squash looks amazing! My New Years Resolution is food planning that allows me to plan the week’s meals and freeze portions for the future. I tried a few prepare ahead and freeze before the holidays and it was a big help when guests arrived! I’m totally in the same boat – I’m all about meal planning this year!!! That’s such a great resolution, I need to do that too!